Do you love grilled cheese? 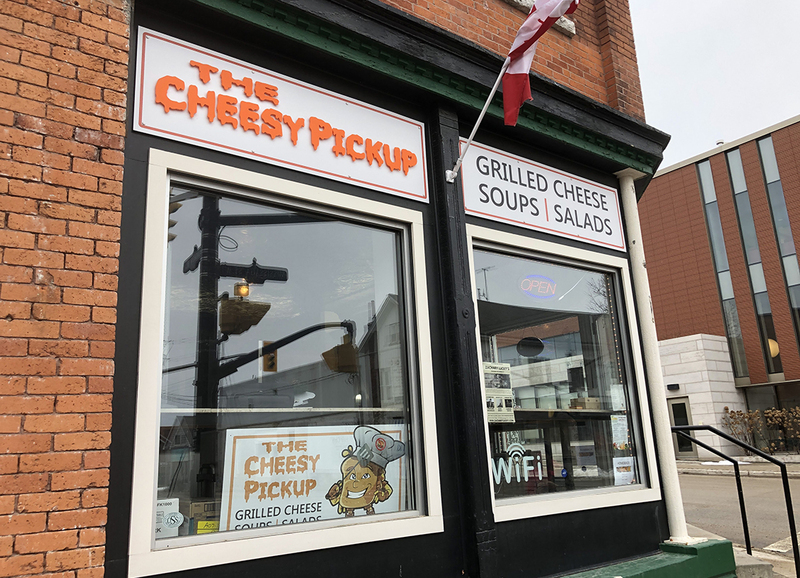 If you do, then you have got to try The Cheesy Pickup in Orillia! Grilled sandwiches are comfort food. The girls and I love having them for lunch on the weekends. We can sit back and watch TV together while eating. Fine and causal dining is great and all, but what is also great is when you find a hidden gem that serves up food that reminds you of sitting in your living room while eating your favourite sandwich. Except, The Cheesy Pickup kicks it up a notch or two with their awesome selection of grilled cheese sandwiches. Rachel had the “Up Your Kilt” grilled cheese sandwich, with a side of homemade Mac & Cheese. That is one big pickle! Lauren had the “Do You Come Here Often?” grilled cheese sandwich, with aside of baked beans. And I had the “All Hail Grilled Cheeser!” sandwich, with aside of baked beans. Craig is not a big cheese eater, so he had a Caesar salad with a side of peameal bacon and a pickle. This is one cheesy menu! Head on Over to The Cheesy Pickup! If you are looking for a quick lunch, that will bring you back to easier times, check out The Cheesy Pickup for an ooey gooey grilled cheese sandwich. Napkins are required!